Quest Glucosamine Sulfate Complex is a high-quality, high-potency supplement that offers a natural, safe, and scientifically validated support for individuals who suffer from the effects of aging joints. This support can be used on its own or as a complement to conventional medical therapy. Ingredients: Each tablet of Glucosamine Sulfate Complex contains 1,500 mg of glucosamine sulfate complex. This product contains no artificial preservatives, colours, or flavours, corn, egg, soy, sulfites, dairy, or gluten. I find this product more effective than any other I have tried. The 1500 mg is very difficult to find so I am grateful to well.ca for regularly carrying it. I have been using Quest 1500mg for a number of years and it works very well for arthritis. I had pains in my knees and after 6 weeks the pain disappeared. Do not hesitate to use it. Great product that I've been using for 20 years for arthritic pain. It's no longer in the stores where I shop. Great online service. 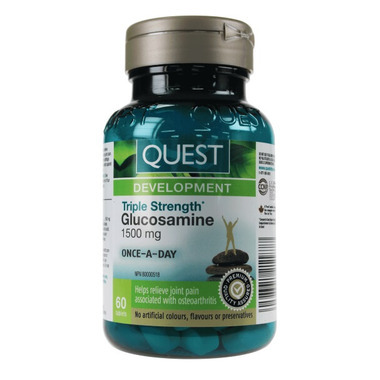 I have been using Quest Triple strength glucosamine for many years. My pain in the knees disappeared roughly 2 months after I started. This is a wonderful product. I've been using glucosamine supplements for a number of years now and changed to Quest's offer about 18 months ago. Combined with proper exercise I have found my bone structure stronger and more reliable w glucosamine supplements. Customer reviews confirmed for me the quality of the product and its ingredients. The triple strength factor was also important because I need only take one per day. I've found Well.ca to be a very customer oriented company where they put satisfaction at the topmost level. Excellent product. I've been suffering from joint pain for years, and this product is amazing!! Quick and excellent service from Well.ca. Good price and fast shipping. It is hard to find triple strength! I got it for my grandmother, she was so happy! It's not easy to find triple strength in the regular drug stores. I actually cannot rate the effect of this product yet, because I have only been taking it for 4 weeks. the effect is suppose to start within 4 - 6 weeks. but the ingredients for the price is great! the only negative thing about it is the size of those tablets, they are huge! this product is great. The dosage being what it is makes it convenient, one tablet a day instead of 3 or 4.